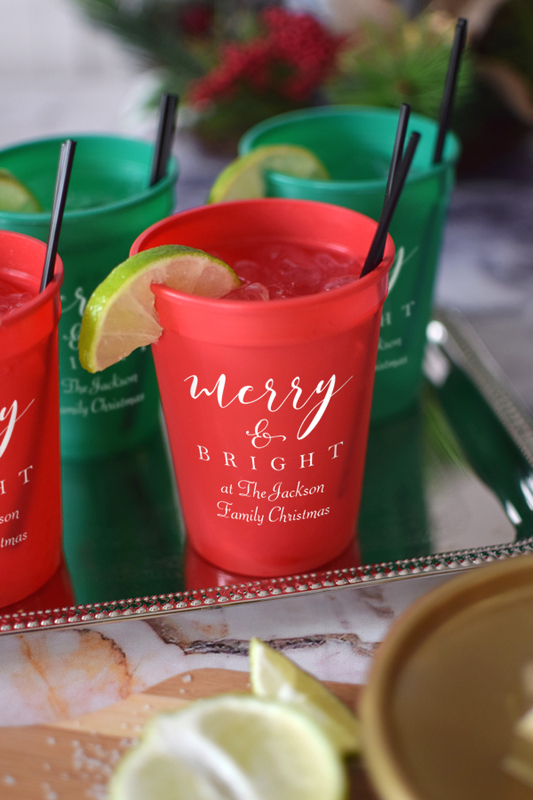 These small, petite plastic stadium cups are a great addition to a holiday punch table, for serving small cocktails, or when used as kids cups measuring just 4 1/8 inches tall by 3 inches in diameter. Personalize with a festive holiday design and up to three lines of custom text for custom Christmas party favors. Your guests will love being able to take their souvenirs home with them to use again and again. I love my cups and canÃ¢â‚¬â„¢t wait to share them with everyone! The cups were great but the customer service was even better! Allison saw that I put a rush delivery in and personally called me to ensure the best way to get my order delivered in time for my party. She also discussed different adjustments for the font and colors I picked so the cups would come out exactly how I wanted! My order was delivered in more than enough time and they were a hit at my party! Big hit, turned out cute & shipped fast. We were very happy with these cups, as they were exactly how we wanted them. The customization was just right, but they were very smelly and each one had to be washed by hand. We were afraid to put in the dishwasher and ruin the printing. Be aware that the printing WILL come off in the dishwasher. Although I only received red cups, no green, they are a great quality with great print on them. Perfect accessory to our Christmas Party! I was really happy with the personalized service for these cups. I was able to put a rush in order and got my cups a couple of days before the event. The cups looked great and they are good quality cups. The only thing I wasn't satisfied with, was the size of the print. It looks rather small in person. The cups were beautiful, but in the future I would really like to see larger print. These were a hit at my party. Arrived early and all looked great! Would highly recommend Tippy Toad for your party needs! Product was as described and was on time!!! Would order again! This company was great to work with! The cups were exactly what I ordered! Customer service was top notch! I will definitely order from Tippy Toad again! These cups were perfect and adorable. Everyone loved them!! Shipping was fast. Very happy with this purchase! I ordered cups for a Christmas party and received them right on time. Everyone loved the finished product! I received an email with an update on my order and another one when they shipped. Cups arrived just as I imagined them from the website description. Love my cups and will definitely order again! Order came sooner than expected (regular shipping). Cups look great! About 5 had smudges when we received them, but I figure that's normal... Would totally buy again! Our party guests loved the personalized cups. We have also washed them several times in the dishwasher and the writing has held up great! Overall these are nice cups. The quality of the cup is great. The print we chose has started to flak off after one wash, which was a bit of a disappointment because I had hoped to use these for a couple different occasions. The print color we chose was the gold, so maybe that is more of a problem with metallic. TippyToad: Thank you, Laura for reviewing your personalized cups. Hand washing with an abrasive pad may cause the printing to flake. We recommend washing personalized cups in the top rack of a dishwasher or using a soft sponge when washing by hand. Love the cups and Allison was so helpful with getting the font just right. The order was perfect!! I would definitely order from you guys again! Prices weren't bad either! Loved the cups. Were delivered exactly as shown on website and on proof. Excellent customer service!! !